Bayan Academy has partnered with the Zuellig Family Foundation (ZFF) in a four-phase research and training project which aims to improve local health ecosystems in various jurisdictions through capacity building interventions for health officers. Last March, the Bayan Academy-ZFF partnership commenced with the first phase of the project -- a local health ecosystem analysis of Bataan province. The primary objective of the local health ecosystem analysis is to holistically map out the health ecosystem of Bataan. 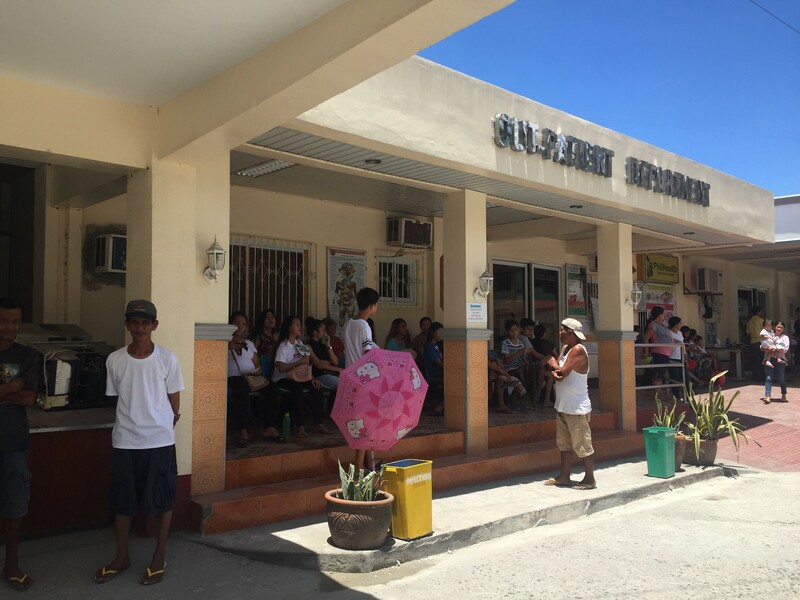 Using a qualitative research approach, the study aims to provide an in-depth understanding of the health ecosystem of Bataan, understand the existing dynamics and structures among health actors in the community, and look into the experiences of the Bataan residents with regard to receiving health services. Bayan Academy tapped Karen Ongtangco, MSOT, MRS, OTRP, OTR as the research lead for the Bataan health ecosystem project. Ms. Ongtangco was supervised by Bayan Academy Chairman and President Dr. Eduardo Morato, Jr. and Consultancy and Research Technologies Director Carlo Sagun. A research associate assisted in data gathering. From March to May, key health actors and stakeholders at the regional, provincial, municipal, and barangay levels were interviewed for the study. A total of 14 key informant interviews and eight focus group discussions were conducted to get an in-depth picture of the province’s health ecosystem. These include interviews with local government officials, municipal health officers, hospital directors; and focus group discussions with barangay health workers and residents of Bataan. Additionally, the researchers collected and reviewed relevant documents to aid the analysis. The research findings have been presented to key ZFF officers and will be used in the succeeding phases of the project. 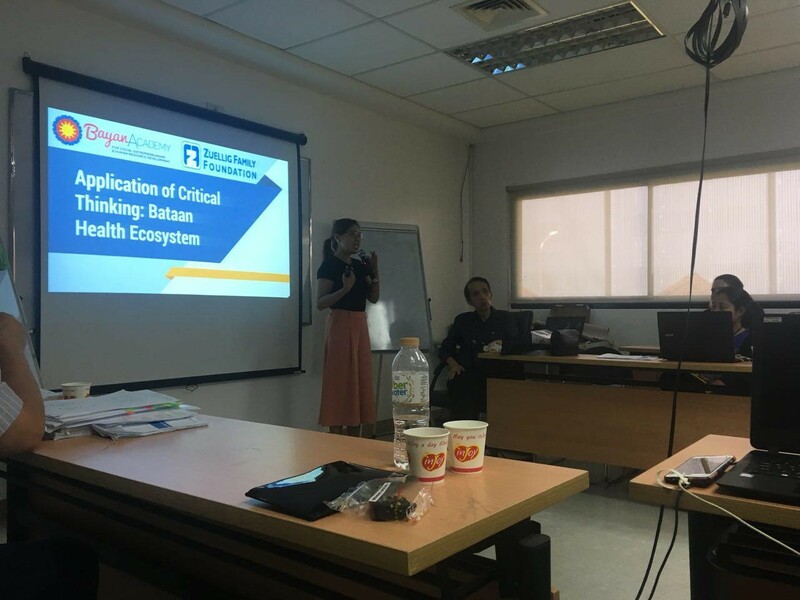 The Bataan local health ecosystems analysis and the development of the manual are parts of Phase 1 of the Zuellig Family Foundation Local Health Ecosystems Research and Training” project. Phase 2 covers trainings on strategic planning and management of a local health ecosystem for relevant ZFF officers and partners, which include provincial health officers and provincial health team leaders. The Health Ecosystem Research Manual developed in the first phase will be used for this training. For Phase 3, insights from the previous provincial trainings will be documented through manuals for provincial health officers and provincial team leaders. Lastly, Phase 4 will focus on the training of health officers at the municipal level. This covers training on the different management processes and designing, developing, and delivering social marketing projects. A Health Project Management Training Workbook will also be developed as material for this phase’s training. Bayan Academy consultants and writers have been tapped for these initiatives. Prior to this engagement, ZFF partnered with Bayan Academy in 2013 for its “Management for Health Development” program. ZFF has been at the forefront of improving health systems in rural Filipino communities. It provides capacity building and management training programs for local government units and local health leaders in its commitment to improve health conditions in the country.